In this world filled with distractions of everyday work and digital media – more and more people are appreciating the therapeutic benefits of downtime and unplugging. Escaping from the hustle and bustle of city life even for just a night or two is such a luxury that most people desire to experience. There’s no wonder why wild camping has gotten extremely popular. Free from the organized campsites, the noise of the crowd, and the distractions from digital media, rough camping is every modern man’s outlet in a very stressful world. If you want to experience the joys of wild camping but is unsure about how it goes and how to start camping in the first place, keep reading. 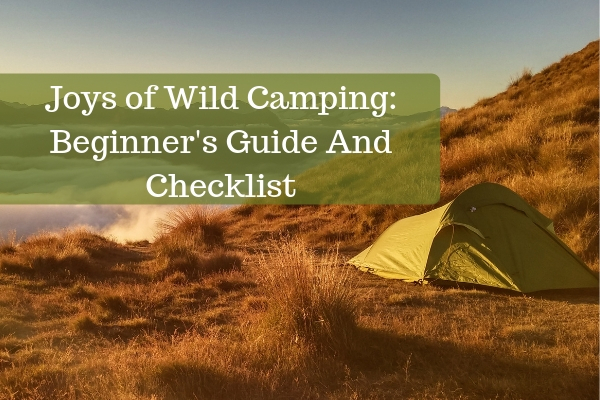 On this beginners’ guide to camping in the wild, you will learn about the things you need and some tips and tricks to make your wild camping experience one of the best. You’re probably not a stranger to local camping where you choose an eco-friendly location from a hundred of campsites that sprung across the country, set up your tent (or use the one that park provides), and get started with your outdoor journey from there. But aside from choosing to camp in designated areas, you can opt to take your tent to the great outdoors far from the crowd, explore the different place, and discover your own perfect camping site. This is called wild camping. And because you don’t have access to the amenities provided by local campsites, you are basically responsible for everything that you need, including your safety from the possible dangers of camping. More importantly, you are responsible for your eco-friendliness. Can you camp anywhere? What camping items do you need? Continue reading to know everything you need to know about camping in the wild. A common question by many is “Can I camp anywhere?” You can wild camp in US national forests and grasslands. You can also set up your camp at the backcountry of national parks although you need to secure a permit and adhere to some regulations. Elsewhere, you need to have permission especially if the land is private property, or if it’s being managed by national, state, and local governments. Always do your research before you start pitch camping. Can you pitch a tent anywhere? One thing you should know is that each state has its own rules and regulations for camping. Surely, there are plenty of free camping USA sites. But there are camping rules to follow. You should be aware that there is always a mix of public and private lands in all U.S. states and it’s up to you to become familiar with the area you wish to explore. Is it illegal to camp in the woods? Camping in National Forest is allowed with certain limitations. You can set up a tent in the woods provided that you maintain its eco-friendliness and you are at a certain range from the trails. While camping in woods is generally permitted in the USA, note that sometimes it is only allowed at specific spots so make sure to check with the local office before going ahead. Another important thing you should know is where to pitch. When looking for the perfect spot, choose flat ground. Check the surface for rocks, branches, and anything that will make your sleep uncomfortable. Try to find a natural shelter or windbreak. If there’s none, pitch a tarp to cover your tent. Be aware of common hazards like rock falls, avalanches, and flash floods. Wild camping is fun… until you realize you missed to pack some important gears and items! Tent. First thing’s first. Definitely, you need a tent! It’s best to use a lightweight backpacking tent for convenience. Make sure that it’s durable and safe for camping at night. Tarp. 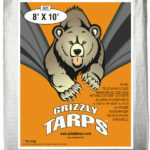 Tarps are every camper’s best friend. You can use it for all sorts of things, from protecting your tent against rain and wind to creating a warm and comfortable sleeping mat or hammock. Just choose a tarp based on your needs. Aside from putting it over on your tent, you can also pitch a tarp to protect your basecamp kitchen. First aid kit. Anything can happen in the wild, especially burns, cuts, scratches, and bumps. Knife and ropes. You need all these to set up your tent, secure your campsite, cook food, etc. Food and stove. You can’t find a restaurant in the wild. Plan for your meals and bring portable cookware. Safety gears. You full camping kit should include flashlights (extra batteries), matches, maps and compass, alternate weather gear, jackets, sweaters, etc. Things to do when you go camping. You can bring some items like cards, board games, a telescope for stargazing, and books. Think of some camping activities at night that you and your companions will all enjoy. Camping mat. There are so many camping mats to choose from. One of the most recommended is the inflatable type because it is such a space-saver. Food. Pack easy-to-prepare meals and snacks like granola bars, sandwiches, nuts, and fruits. You need calorie-dense, protein-filled food to sustain your energy throughout an exciting wild camping journey. Be sure your surroundings are safe. Camping in the middle of nowhere might seem like an exciting idea. But to avoid the possibility of camping gone wild, make sure that you are pitching your tent somewhere safe and secure. Ask recommendations from locals for a suitable area to camp. If you’re camping near a settlement, it’s best to have the local’s blessing. Study your trails. You won’t have someone to help you out in case you get lost or something. So, take time to study the area you are camping in. Always get a hold of your map and compass. Have a back-up plan in case something unexpected happens. Check for the nearest health and police stations and have their contact information. Never light an open fire. One of the reasons why wild camping is regulated is because it could pose danger to the environment. Unless you have permission to do so, never light open fires. Not only do campfires damage the ecosystem, but they could also potentially destroy acres of countryside. Leave no trace. Leave your campsite the way it was when you arrive. Never leave trash or anything that destroys its eco-friendliness. It goes without saying that you need to clean your clutter and take your litter home. Consider wildlife. You might be the only person out there in the woods. But remember that there are animals that treat it as their home. Do not camp in a place where wildlife or local livestock will be disturbed. Wild camping gives anyone a wonderful opportunity to explore the great outdoors, appreciate the natural environment, and recuperate from the hustle and bustle of the city life. But it comes with certain risks too. With this wild guide, you can make your camping experience fun, memorable, safe, and successful. Happy camping!